This extraordinary straightener can tackle the most hard-to-handle hair, all while protecting it for the long term. 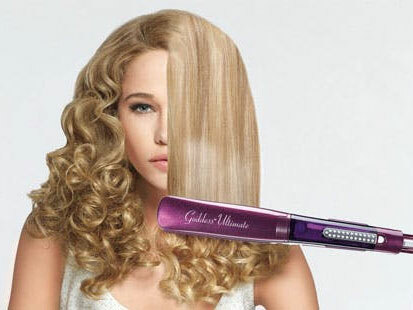 VS Sassoon's new Goddess Ultimate – an update on the best- selling Goddess Straightener of 2010. No other styler on the market can achieve the same results for shine, speed and long-lasting results. Steam Straightening – How Does it Work? Repeat after me: "Moisture is not my enemy". Far from it, in fact it's your best friend! The Goddess' nourishing steam doesn't at any stage wet the hair. Rather it works by opening up the hair cuticles and infusing moisture into them before the straightener then seals them, polishing and protecting the hair at the same time right to the ends. For people with curly, coarser or thicker hair, it's especially effective (their hair tends to be drier because of the way their hair cuticles are formed) - the steam, relaxes, hydrates and nourishes the cuticles for smooth polished results! The VS Sassoon Goddess Ultimate also makes hair resistant to humidity, meaning a frizz-free, shiny, soft-to-the-touch, long lasting finish – yes even in Bali! It can be used to create straight hair in seconds. With a return to poker straight long hair on the catwalks you can say goodbye to the BOB and even the LOB and instead say hello to lady-like long luscious locks. Christian Dior, Michael Kors and Sonia Rykiel were just a few of the designers that went all out for this look on the recent runway and the styling was excitingly varied - think sleek ponytails, half-ponytails tied at the back, or left free and untied. With the New VS Sassoon Goddess Ultimate you can enjoy extraordinary hair, worthy of a thousand Goddess moments.